High ceilings, tons of natural light, and a bright paint job does wonders for Europe’s fourth-busiest terminal by bringing a sense of calm to the crowded concourse. With great design, an airport can be a way to show off to foreign visitors. Madrid’s Barajas Airport, more specifically, the new-ish Terminal 4, is a prime example. 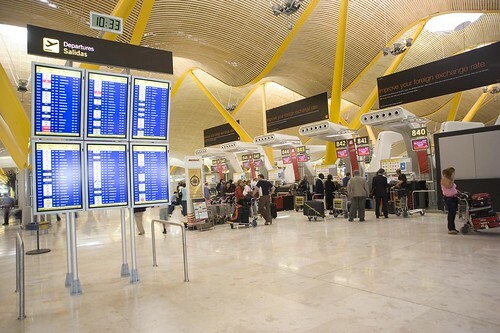 Jaunted ranks T4 of Barajas “one of the coolest airports.” Photo by Iberia Airlines. The terminal strives to provide passengers with a stress-free beginning to travel, with natural light pouring from sweeping peaks in the bamboo roof to a sensible industrial use of glass and metal. The airport is the fourth busiest in Europe which can only mean that more and more passengers jump off on their journeys a little calmer than usual…embrace the long layover.